So here we are in London. After a couple of days of recovery (and sightseeing!) our first event involving Han Dong took place yesterday, at the Young Vic. The event was a part of the two day Free the Word program put on by International PEN, and featured seven or eight poets and writers from around the world reading for five to ten minutes each. There were homages to Harold Pinter and Adrian Mitchell, tales of detention, homelessness, and the unfriendly welcome that awaits immigrants at the British Home Office. Of all the authors (who came from Cameroon, Iraq, Nigeria, Ethiopia, and Mexico, among other places), only Han Dong had interpretation. The rest weren't all up to BBC broadcast standards, but they spoke English. I found this interesting – I'm not sure whether it says more about China, about the rest of the world, or about the PEN event. Chinese writers who speak fluent English are rare (nonexistant?). Most of the other foreign writers had written about their experiences as immigrants to the UK. 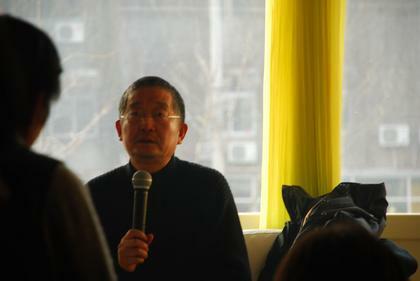 Chinese writers get dissident status just by virtue of being both Chinese, and writers. Every one of the readers that day read something against the establishment – tales of police brutality, protest, living down and out – except Han Dong. He read about the dusk, and visiting a prostitute, and the sound of glasses clinking. Whatever may be anti-establishment about Han Dong (and I believe there's plenty) is not immediately obvious in his poetry, at least not the way it was obvious in the other readings. And yet he was happily welcomed into the company, a brother in suffering. I wonder if they were confused by what they got. I don't think he quite identified, at any rate. I just now asked him, "Han Dong, do you think you're an oppressed writer?" "Me? Who would oppress me?" He had been put in a particularly good mood by My Home is on the Songhua River (我的家在东北松花江上) and didn't seem to recall his burdens. We've made a few additions to the site recently, so please have a look around. The first is a directory of translators, to make it easier for publishers to locate appropriate translators; that list will be growing filters and searches over the next couple of weeks. The second is resources sections aimed at both publishers and translators, with frequently asked questions, and general background information. We want to expand these sections as much as possible, so please do leave suggestions in the comments here or on the resources themselves, or email us. Of all the types of value judgments, the worst is the vilification of those who have thought too much and too deeply, who have gone beyond the grasp of their accusers. While we experience the pleasures of thought we cause no harm to anyone; unfortunately, there are always some who feel they have taken harm. Honestly, it is not everyone who can feel this kind of pleasure, but we cannot be held responsible for that. I can see no reason for the negation of such pleasures, unless one takes a despicable sort of jealousy into account. There are some in this world who like variety, and some who like simplicity; I have never observed those who love variety to be jealous of those who like simplicity, nor cause them any harm, I have only ever seen the opposite. If I know anything at all about science and art, it is that they are fed equally by the broad river of the pleasure of thought. This river benefits all humankind but it does not, as some imagine, flow for any one of us alone, just as those who take pleasure in thought were not born for anyone but themselves. From 思维的乐趣 (The Pleasure of Thought), from his collection 我的精神家园 (My Spiritual Homeland). As a bit of a contrast to the last post about Yu Hua's Brothers and how it's reviewed, here's a translation of the eponymous headline review from Pulling Yu Hua's Teeth, a collection of hatchet-jobs on Brothers that was published in China in 2006. It's neither the worst nor the best example of Yu Hua-related criticism, but it was one of the more prominent. Two recent events have shaken up China's literary world. The first occurred when a certain famous literary critic [白烨 Bai Ye] criticized 'Post-80s' writers, offending 'race-car driver' Han Han and his friends and drawing such heavy fire that he was forced to close his blog. The second was the publication of the second volume of Brothers by the renowned writer Yu Hua, and its prodigious sales around the country. The spring weather may be chilly this year, but things are already lively in China's book circles – all those literary folks had hibernated long enough. The only real shame was that the two so-called 'events' were so lacking in literary value – particularly the former, in which the 'race-car driver' came off as particularly vulgar and shameless, and entirely lacking in cultivation. But it was hardly worth getting upset about; some of our famous critics really do have issues, and it was only a matter of time before Han Han was rude about it: the old man should have seen it coming. But when it came to Brothers, by the famous writer Yu Hua, the world of literary criticism responded with a coordinated attack that was gratifying to see. Even diehard apologists like Xie Youshun, Zhang Yiwu and Chen Xiaoming finally listened to their consciences and began to actually criticize. Assaulted from all sides, Yu Hua made a show of turning up his nose in contempt, but he's also a 'writer' of some refinement and he wasn't going to lose his cool. He showed far better quality than Han Han, which was a bit of an eye-opener. Renditions, an international journal of translations of Chinese literature into English, is looking to hire an Assistant Editor; see this link for application details. *The following is the translation of a blog post by Li Yinhe (李银河), widow of the writer Wang Xiaobo (王小波). Some publishers came to talk about a manuscript, and left me one of their own books as a sample of their work. The writer's name is Feng Tang, both of which characters you can find in the Hundred Names [a compendium of the most common surnames in China]. My guess is that his father was surnamed Feng and his mother surnamed Tang; I've met other people who got their names that way. The title of the book is You Live and Live and Then You're Old (活着活着就老了), which caught my eye. I looked through it and it's excellent, I couldn't put it down once I'd started, and read it all the way through in a day and a half. Apart from a few later pieces about Beijing and Hong Kong that weren't that good, and apart from a few places where the same phrases were used repeatedly in different essays (was the writer too busy to read the whole thing through before publication? ), and apart from some harsh evaluations of Wang Xiaobo, the book was very, very good. In it he mentioned laughing out loud twice while reading Wang Xiaobo's books. Reading someone's books and laughing however many times: I'll borrow this phrase, and say that I laughed out loud seven or eight times while reading his book. 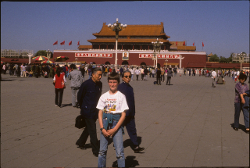 I developed asthma after I came back to China in 1988, and though it got better it never entirely went away: I have an athsma attack every time I have a laughing fit; listening to crosstalk is a risky business for me. This book nearly did me in; there were eight times I almost had an attack. If I ever have the opportunity to meet this person I'll have a bone to pick with him. In the book he divides writers into those who "spit out" one book, those who "spit out" two books, and those who "spit out" many books. His use of the word "spit" hit me like a thunderclap: I had once imagined that real literature might be in my future, but the word "spit" dispelled my fantasy for good. I asked myself if I really had anything I needed to spit out, and concluded that I should just stick to my sociology, and enjoy life in my spare time. They say that the media is in the hands of the generation born in the 1970s. Of the people mentioned in Feng Tang's book, I've read the writing of Luo Yonghao [whose Bullog blog site was recently shut down] and He Caitou; they must be approaching 40 now. They're 20 years younger than us, a whole generation. They've already become the pillars of modern China's intellectual world; we should have respect for our juniors. The following is a translation of this blog post, which came down the feed reader a day or so ago. Soon after President Hu, at a very formal meeting, said the words "do not waver, do not slacken, do not mess around" (不动摇不懈怠不折腾), this phrase started to get popular. It was a bit of a shocker to hear something so slangy as "mess around" (折腾, zhéteng) come out of the mouth of a solemn, venerable personage like the General Secretary, and soon everyone was saying it. But then some official media with nothing better to do started writing reports ("Translating 'Zheteng' from Hu Jintao's Report Stumps International Media") about how the proper English translation of 'zheteng' was "stumping language mavens in both the domestic and foreign media". They underestimate us! A little phrase like this doesn't need a language maven to figure out, it's a piece of cake. According to the rule of 'crude for crude, elegant for elegant', I can think of a few translations: "no fooling around", "no messing around" or, if you want to get crude, "no fxxcking around" (these are all verb phrases). The translators aren't translating it, and everyone's talking around it, simply to keep from embarrassing President Hu. They're keeping it as "bu zheteng" because they have no other choice. What's hilarious is that some retards in the Chinese media have written puff pieces saying that the Chinese 'bu zheteng' might even become a catchphrase in English. They shouldn't get their hopes up; the answer would be "No thanks. We've got plenty of words of our own, quit messing with our language." The way I see it, compared to 'bu zhengteng', some other suggestions from netizens' like 'not to huqiunong' (the Shaanxi version) or 'don't xiaqiunao' (Shandong version) have a better chance of making it into English. Anyway, I suspect Hu Jintao was straying from the script when he said this, it doesn't sound like the sort of a thing a scriptwriter would come up with. Now everyone's elated that a Party boss could talk this way, they though they were off the hook as well. But in olden times they used to say you have to both listen to a man's words and observe his actions – I for one remain deeply skeptical. If a political party that makes a rule of "messing around" were to suddenly straighten up and fly right, they'd have no clue where to even start. Besides, before long they're going to roll out another movement, either "compulsory" or "optional"; they may say they're not "messing around", but it sure looks like it to me. The One Way Street Bookstore is putting on a talk with A Cheng this weekend at its Wanda Plaza location. A Cheng is renowned as a free spirit and a bit of a contrarian; I've run into him a few times, though, and he's usually just seemed crotchety and confused. Still, he's a Personality, and the event ought to be interesting. Update: The Bi-Cultural Freak went to this event, and wrote a bit about it, plus pictures. We hereby steal one of her pictures, though stealing with permission takes most of the fun out, doesn't it. Art arises from witchcraft. It has no religious faith; it's good at dispelling all that. It dispells stress. Errenzhuan [a kind of two-person song and storytelling routine from northeastern China] is a kind of witchcraft. In ancient times witchcraft was a primary form of performance. There were all types and kinds. Many artists suffer now. It used to be that if you were a painter you just painted… Now it's about politics, publication… You work all day, then struggle all night. Errenzhuan: it's a soporific; the northeast; jumping rope. One person says: I'll make your Granny appear, the other: okay, no problem. And it really sounds like his grandmother's voice. All the bystanders get involved. I worked in a labor team in the northeast when I was young, it snowed starting in September, so what could you do but listen to errenzhuan? Errenzhuan's got these robes, and they squat and waddle around – that's all witchcraft. And it makes you laugh out loud, it can make you laugh at anything, like that Zhao Benshan [a comedy actor from the northeast] – it's a soporific. Art. It has a hold on everything, on every craft. As I said: a little crotchety, a little confused. PS: Can someone weigh in authoritatively on the A Cheng vs Ah Cheng vs Ah-Cheng issue? My fingers type something different every time.